Diamond is an exceptional material as a result of its sp3 hybridisation, which results in advantageous properties such as high thermal conductivity, extremely high electrical resistivity, hardness, and it is also a wide band gap semiconductor. In its doped form (e.g. 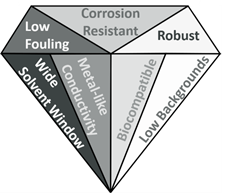 boron-doped diamond, BDD) diamond becomes electrically conductive, exhibiting a number of beneficial properties as an electrode material; these include wide solvent window, low background currents, reduced fouling, biocompatibility, and corrosion resistance at high temperatures, pressures and in challenging environments. In our laboratory we endeavour to exploit many of these aforementioned material properties in our research. Most of the BDD we use is cut from high-quality freestanding chemical vapour deposition (CVD) grown wafers. Examples of material properties of BDD electrodes. Due to the mechanical properties of BDD, its fabrication into devices is challenging. Laser micro-machining, however, offers a viable option to shape diamond wafers into usable devices through the use of a nanosecond pulsed laser. Using this method diamond electrodes of any geometry can be fabricated and we have demonstrated utility across a myriad of applications. 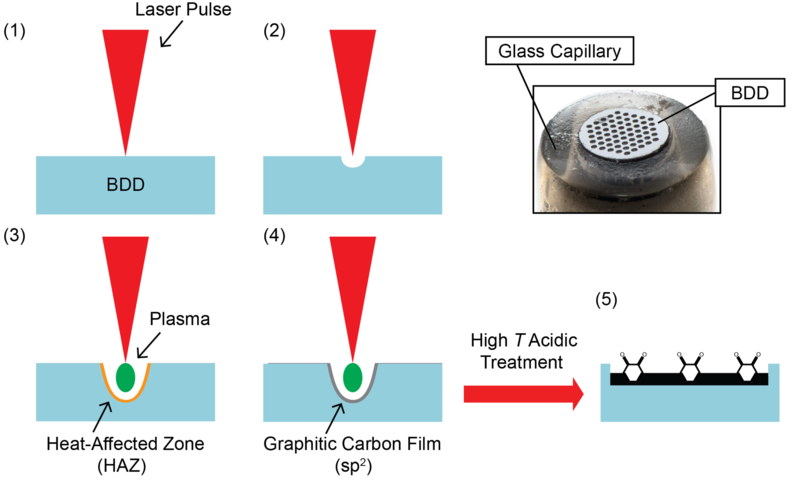 Additionally, laser micro-machining of BDD can be used to controllably introduce sp2-based carbon into the sp3 carbon BDD surface, which can have a significant impact on the electrochemical performance of the BDD material, as discussed in the “Sensing” section. Laser micro-machining of diamond to produce robust incorporated sp2 regions. Laser micro-machining has also enabled the development of an all-diamond platform as a solution to provide a more robust packaging (i.e. the seal between glass or polymer packaging and the diamond can often fail). This type of electrode fabrication also minimises any contributions of sp2-based carbon from the side-wall of the laser-cut BDD disks. We have found this to be a critical step in producing high quality BDD sensors. Examples of different all-diamond electrode devices. The colourless portions are intrinsic diamond whereas the black regions are boron-doped diamond. One aspect of our research focuses on the fabrication and optimisation of BDD micro- and nano-particles for electrochemical applications. BDD is now widely used as an electrochemical sensor material in its CVD grown wafer form, however, moving to a particle form opens up a much wider range of possible electrochemical devices using fabrication techniques such as screen printing. High pressure high temperature (HPHT) synthesis of diamond offers a much cheaper alternative to CVD diamond production, and thus fabrication of HPHT BDD particle-based electrodes also has the potential to significantly reduce the cost of BDD devices. We have also investigated a combination of ion implantation and non-contact electrochemical etch techniques to produce sub-micron thickness diamond membranes for combined optical electrochemical sensing. The aim of this work is to produce thin membranes containing nitrogen vacancy (NV) defects, which have applications across many emerging and current fields such as photonics, quantum computing, magnetometry, and sensing. However, in many cases, exploitation requires that the defect resides close to the surface of the diamond. Therefore, by producing a very thin membrane, the defects have nowhere else to reside, which results in a near-surface defect. Visual representation of the etch process of a single crystal diamond sample from t=0 to t=120 minutes, each image is separated by approximately 8 minutes of etching. “A practical guide to using boron doped diamond in electrochemical research” J. V. Macpherson, Phys. Chem. Chem. Phys., 2015, 17, 2935-2949. A major component of research in our lab centres on the development and optimisation of diamond-based electrochemical sensors. Specifically, the measurement of factors such as pH, conductivity, heavy metal contaminants, and chlorine are fundamental to a wide range of industries such as water quality monitoring, wastewater treatment, food/beverage processing, agriculture, and healthcare. Selectively graphitised BDD electrodes can be produced through a laser micro-machining process, this enables electrochemical functionality which is usual unavailable due to the nature of high quality BDD material whilst maintaining the beneficial material properties. The utility of such sensors has been demonstrated in several key areas. Here are three examples of laser machined polycrystalline, glass-sealed BDD 1-mm disk electrodes demonstrating the different patterns explored. The white portions are primarily pristine sp3 carbon whereas the black portions are largely sp2-based carbon from the laser ablation process. We have previously demonstrated that these sp2-sp3 hybrid sensors that display a Nernstian response (i.e. produces a linear potential shift of ca. 59 mV pH-1 under ambient conditions) to changes in pH. These diamond-based sensors provide key advantages over traditional, glass-based pH probes, offering fast response times, small sizes, low fragility, and robust detection. This work demonstrated that our laser micro-machined BDD electrode can be reliably used to measure solution pH via quinone surface electrochemistry. One of our focuses is on the development of these electrodes towards use in biological systems, where current pH measurement methods often suffer issues due to their size, propensity to fouling, and fragility. As such we are investigating these BDD pH sensors for flow independence and application in a biological system with minimal fouling in the presence of complex matrices (e.g. proteins) where currently available methods fail. Additionally, these sensors have been optimised for the simultaneous detection of dissolved oxygen and pH in buffered aqueous solutions and more complex biological media (e.g. blood). This latter work has significant implications for bio-medical applications where fast-responding, inexpensive, and high sensitivity detection in monitoring pH and oxygen levels is paramount to device function. This work demonstrates that our laser micro-machined BDD electrodes can be used to simultaneously measure the solution pH (via quinone surface electrochemistry) and also dissolved oxygen in a single measurement. These hybrid sp2-sp3 BDD electrochemical sensors have also recently been used for hypochlorite, the main component in bleach, detection at high concentrations (e.g. molar concentrations). Our BDD sensors excel in the harsh, chemically oxidising, and highly alkaline solutions associated with bleach, where other electrodes fail. Additionally, we are exploring avenues for low free chlorine (i.e. Cl2, HOCl, and OCl-) detection (e.g. ppm concentrations), which is critical to many industrial and commercial processes. Heavy metal monitoring is of vital importance to environmental scientists. Electrochemical sensors for heavy metal detection could provide an opportunity for in-situ monitoring, allowing for better temporal and spatial resolution than can currently be achieved with lab-based analysis (i.e. inductively coupled plasma – mass spectrometry). To accomplish this we use a local secondary electrode-type design (i.e. a ring-disc electrode configuration – vide infra) to control the pH via water electrolysis, which permits quantification of both the available metal and the total metal ion concentrations. Boron Doped Diamond Ring Disc Electrode: Central 1-mm disc with an outer ring used for pH control. Electrodeposition is a key process for producing functional materials, we have recently developed a method that allows us to follow the growth of an electrodeposit from an individual metal atom through to a crystalline metal nanoparticle. 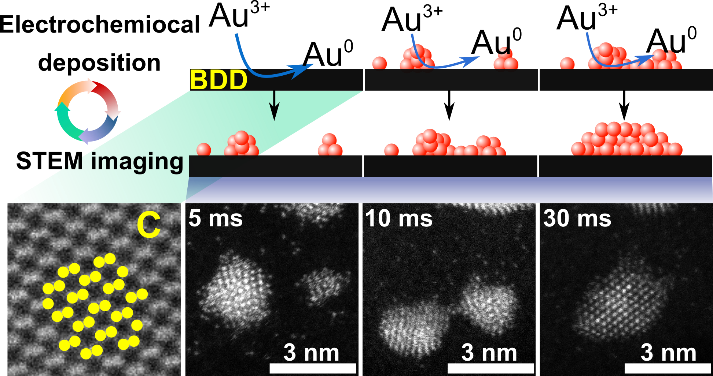 We accomplish this by means of pulsed voltammetric methods and using identical location scanning transmission electron microscopy (STEM), with a BDD platform that serves as both an electron-transparent TEM substrate and the electrode, allows us to interrogate this process at a level not yet seen. Demonstration of tracking gold electrodeposition on BDD-TEM electrodes. There is a growing interest in the use of electrochemical oxidation processes for water incineration and selective organic synthesis. BDD is an attractive electrode material for these applications as water can be oxidised to produce hydroxyl radicals (or methanol to produce methoxy radicals etc. ), which is not possible on more catalytic electrode materials. Some of our work aims to understand the mechanism before the electrochemical formation of hydroxyl radicals on boron doped diamond and apply this knowledge to electrochemical organic synthesis. Additionally, we are working on an electrochemical pre-concentration technique to use with X-ray fluorescence spectroscopy (XRF) for the analysis of aqueous metals (e.g. Cu, Pb, Zn, Cd, etc.) at low concentration. This technique takes the advantage of electrochemical sensitivity and XRF’s easy elemental identification. This involves three main components: (1) mass transport during pre-concentration (i.e. using rotating disk and flow cell geometries), (2) design and development of an XRF optimised BDD electrode, and (3) examining metal electrodeposition studies.